Brazil coach Luiz Felipe Scolari says his side will cope without injured striker Neymar when they face Germany in Tuesday’s World Cup semi-final. The 22-year-old has scored four of Brazil’s eight goals at the tournament but will play no further part after he suffered a fractured vertebra in the 2-1 quarter-final win over Colombia. 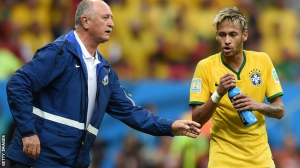 Scolari said his squad were fully focused on the task at hand. “Neymar has done his share. Now it’s up to us to do our share,” the coach said. “We have accepted what has happened and we are focusing on other things.